Kalyan minaret. More properly, Minâra-i Kalân, (Persian/Tajik for the "Grand Minaret"). Also known as the Tower of Death, as according to legend it is the site where criminals were executed by being thrown off the top for centuries. The minaret is the most famed part of the ensemble, and dominates over historical center of the city. The role of the minaret is largely for traditional and decorative purposes—its dimension exceeds the bounds of the main function of the minaret, which is to provide a vantage point from which the muezzin can call out people to prayer. For this purpose it was enough to ascend to a roof of mosque. This practice was common in initial years of Islam. The word "minaret" derives from the Arabic word "minara" ("lighthouse", or more literally "a place where something burn"). 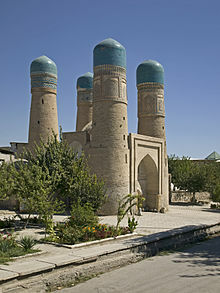 The minarets of the region were possible adaptations of "fire-towers" or lighthouses of previous Zoroastrian eras. The architect, whose name was simply Bako, designed the minaret in the form of a circular-pillar brick tower, narrowing upwards. The diameter of the base is 9 meters (30 feet), while at the top it is 6 m (20 ft). The tower is 45.6 m (150 ft) high, and can be seen from vast distances over the flat plains of Central Asia. There is a brick spiral staircase that twists up inside around the pillar, leading to the landing in sixteen-arched rotunda and skylight, upon which is based a magnificently designed stalactite cornice (or "sharif").